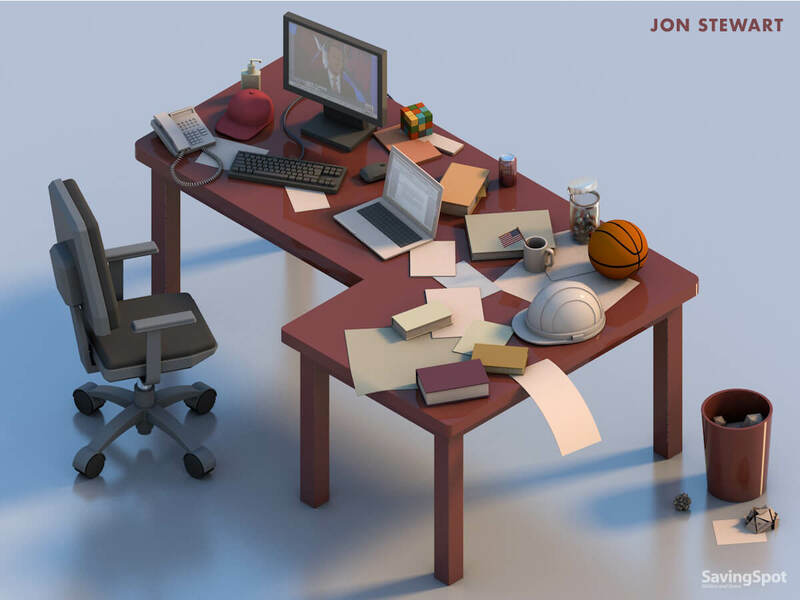 For most workers – whether they be interns or CEOs – the majority of professional life happens at a desk. 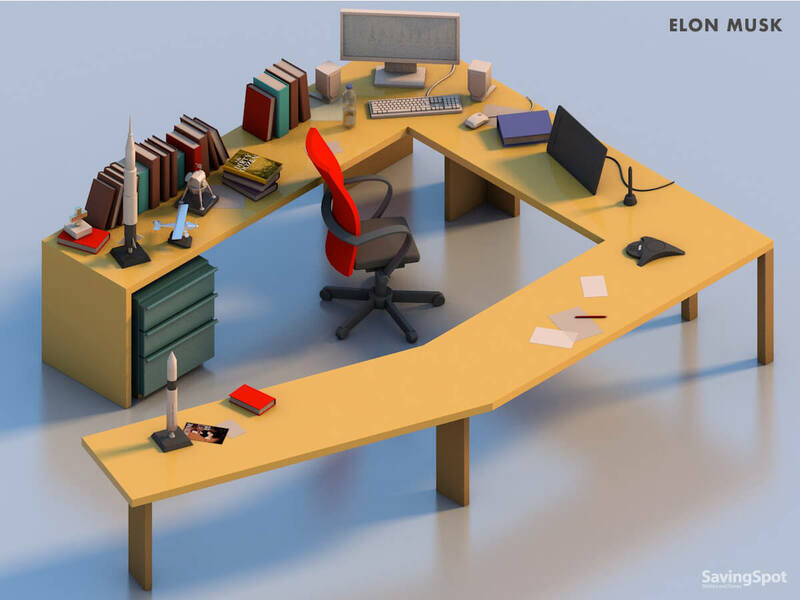 Thus, it stands to reason that their desks can have a significant impact on their inspiration and passion for work. To explore this idea further, we’ve taken a look at the workspaces of the greatest minds in the world. For some it’s about order and meaning, and for others it’s the weird and wonderful – but in the end it’s all about what helps them get the most out of themselves. 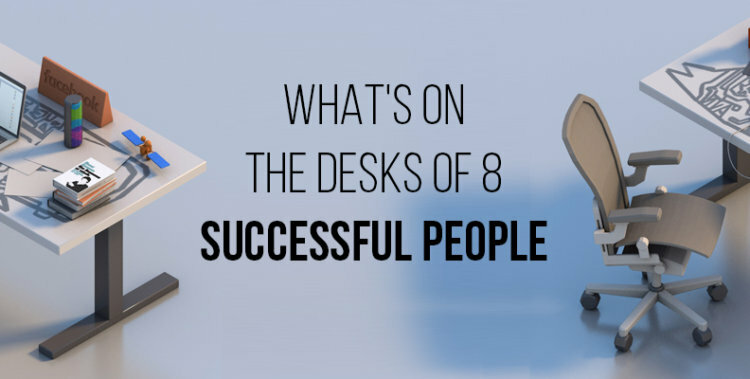 For one of the most powerful CEOs in the world, Mark Zuckerberg’s desk is relatively unsophisticated. 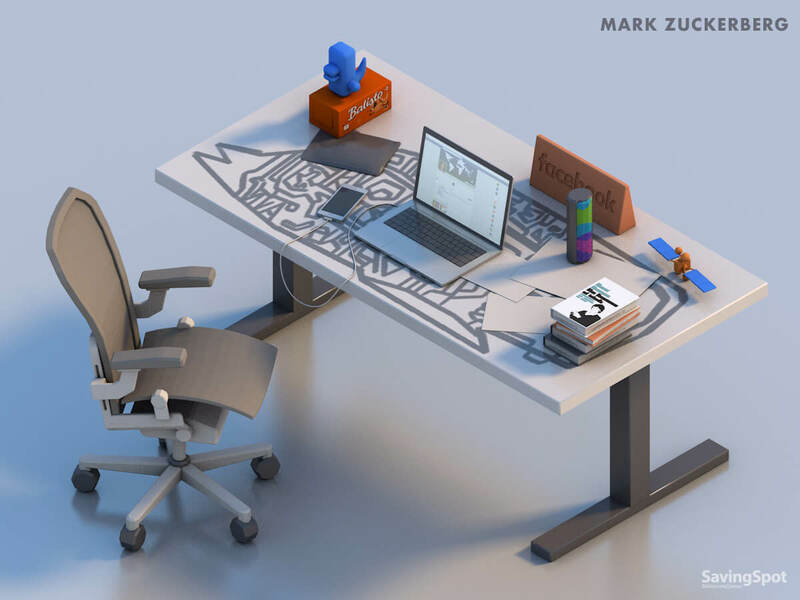 Customized with graffiti art that says ‘Zuck-1,’ the desk sits in the middle of the office among his staff, showing he’s not afraid to openly lead by example. Most of its ornaments have significance for the company he helms, like a carved wooden imprint of the company’s logo and a stuffed version of Facebook’s privacy dinosaur. But there are also inspirational items, including a model of the satellite Facebook intended to use to bring wireless internet to Africa and a stack of books from his ‘Year of Books’ challenge. During Jane Goodall’s revolutionary decades of research on chimpanzee behavior in the wild, she spent nearly all of her time in the field. 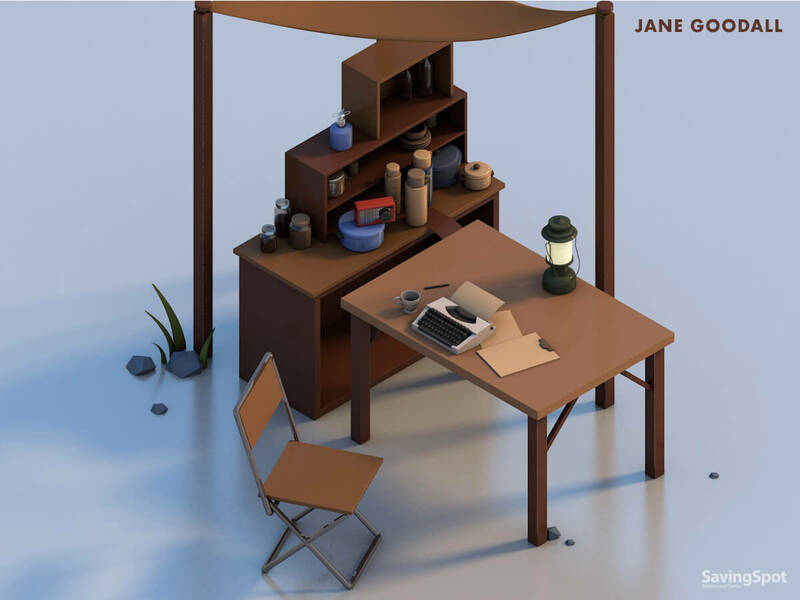 This meant that her desk set-up was simple and full of functional objects. Jars, flasks, pots and a typewriter where she diligently recorded her notes were some of the key items on her dining table-turned-desk. Her transistor radio kept her in at least some contact with the outside, non-chimpanzee world. Roald Dahl’s custom ‘writing shed’ was a haven for his creativity. His desk was full of objects that reminded him of his adventures across the world, like a Sumerian tablet with cuneiform script and a model of the Hurricane plane he flew in WWII. But it also held objects that delighted him and inspired some of his fantastical stories for fans, including a ball sent to him by a young boy who made it out of silver chocolate bar wrappings, and a raw opal, which a class of primary school children in Australia found and sent him as a gift. One of the stranger additions to the desk was Dahl’s own hipbone. 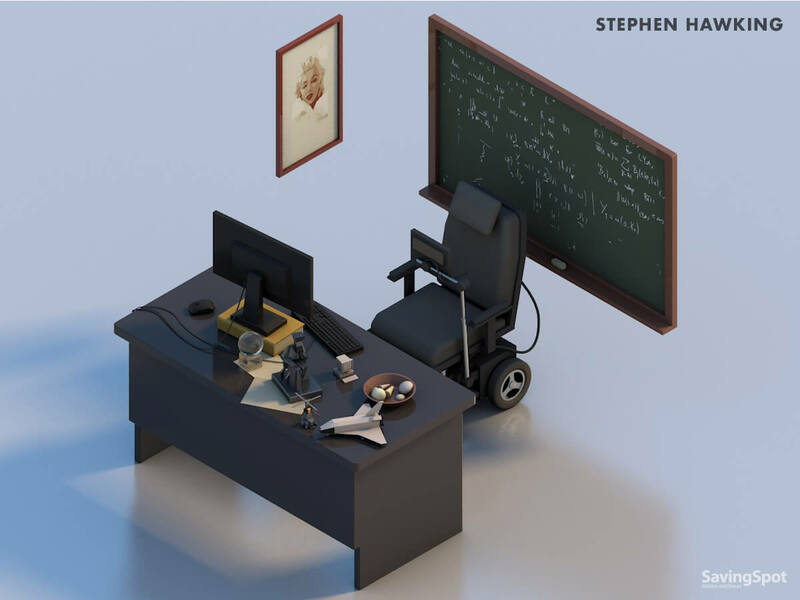 While his entire life can be seen as an inspiration to others, Stephen Hawking’s desk was filled with things that stimulated his own creative mind. Among these was a model of a space shuttle and a crystal globe with a map of the world, which was a gift from NASA. He also kept signs of his humorous personality around, including a model of his character from the Simpsons, complete with helicopter blades and a boxing glove on a spring to punch annoying people. Another former Simpsons cameo and one of the greatest minds of his generation, Elon Musk’s spacious corner cubicle shows his fascination with outer space. Two rockets – including his own SpaceX rocket, Falcon One – along with the lander from the Apollo space mission take pride of place. 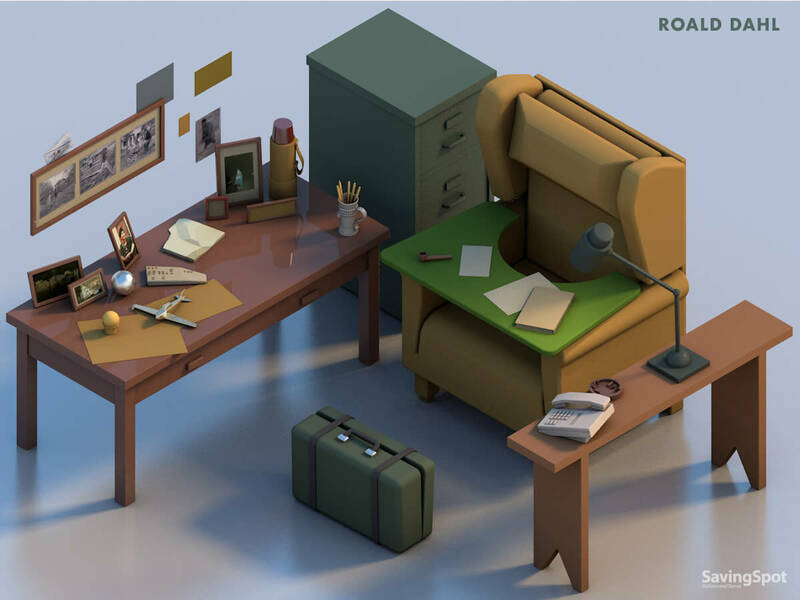 These decorations are complemented by the more functional items one might expect, such as a tablet for sketching designs and a desktop computer with a large monitor. Jon Stewart made the idea of ‘news as comedy’ a thing at the turn of the century. But while modern newsrooms have reporting hierarchies and constant newsfeeds, a comedy writer’s desk is generally one of constant bedlam. Stewart is no exception. With a jar of gumballs, a construction helmet, a Rubik’s cube and a trusty MacBook all clamoring for space among mountains of papers, this desk is a testament to the fact that productivity can happen even in the most chaotic of spaces. 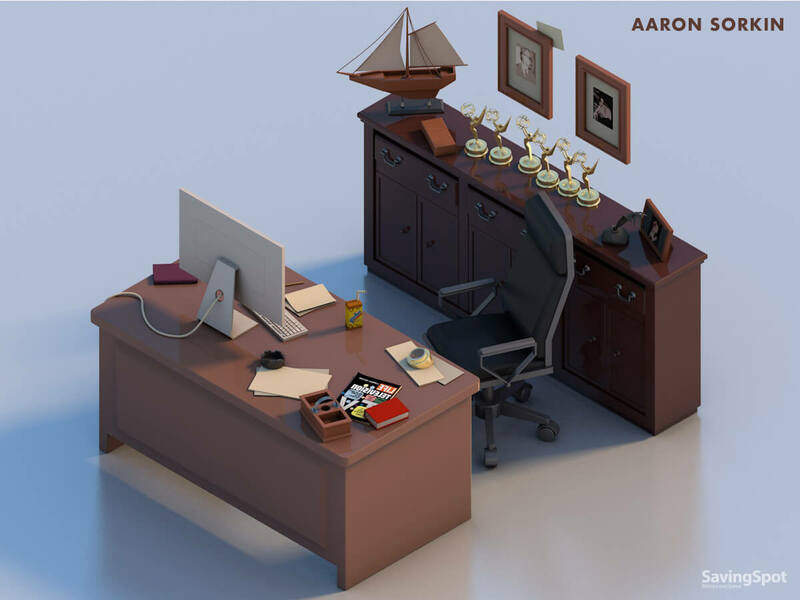 Being a writer requires varied sources of inspiration – and with Aaron Sorkin’s wide range of projects, it’s no surprise that his desk contains both the classy and the obscure. An old copy of Life magazine lies beside an antique cigarette holder, while his six Emmy Awards line up behind him alongside a model sailing ship. The object he keeps closest to him while working on script? A Yoohoo chocolate drink, of all things. 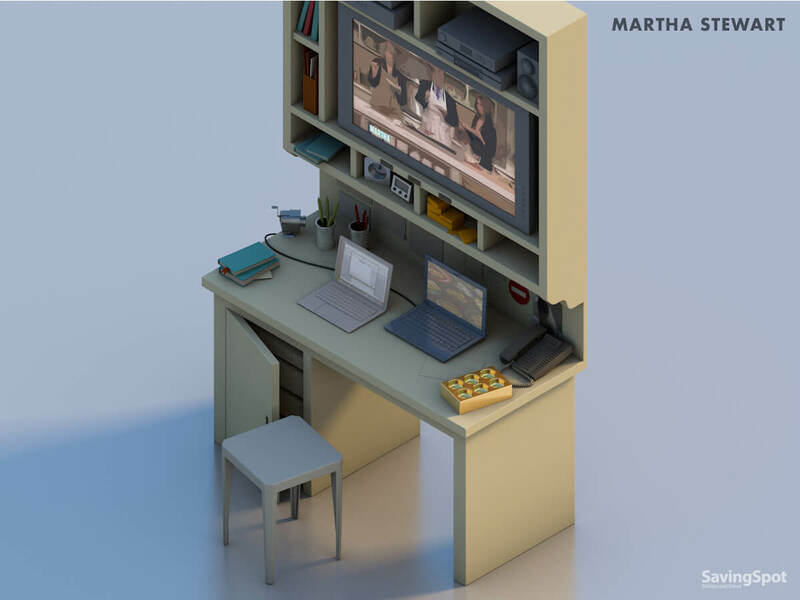 As one might imagine, Martha Stewart’s desk epitomizes working hard while keeping everything in order. Her workspace was been built into her kitchen and makes excellent use of the space and shelving around it. Two laptops and a large TV take the central role for activity, but there are also stacks of reference books, post-it notes and folders close at hand for whenever they’re needed. We particularly like her small ‘caution’ labels and ‘do not enter’ sign, which are no doubt intended keep curious guests at bay. If most of your professional life takes place at a desk, it’s important to ensure that it supports your creativity and productivity. While the great minds mentioned here all take different approaches to decorating their workspace, they all demonstrate that the most important thing is making it your own.